The weather pattern we’re currently in is bringing us a mixed bag of weather treats, the typical dry hot summer days seem a little less frequent at the moment, spring and summer currently being interrupted by a pattern of significant cooler wet days (more lately a week or two…). However with a bit of warmth in the soils this should promote feed growth. Certainly our gardens will be looking at their best this time of the year and presentation is of course a key factor when selling your property. 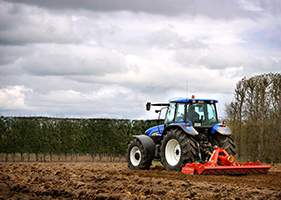 So whilst many rural lifestyle block owners will be busy dealing with matters at hand such as some last minute maintenance before a summer BBQ or mowing that cricket pitch on the front paddock for the backyard test many others are in fact busy preparing their properties for the reason of selling. No matter if it’s moving down the road to a new larger lifestyle block or a shift in location for a new job that results in the need to move on, the reasons vary, but from time to time we need to sell our lifestyle property and the best time to do so is when things are looking their best. We’ve just recently completed our latest visits to local A&P Shows for 2018 and at the recent New Zealand Agricultural Show in conjunction with STIHL we once again gave away a magnificent STIHL Combo Pack. 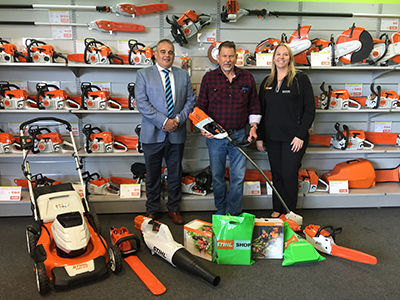 Winner Alan Martin is seen here receiving his prize pack from Harcourts Four Seasons Rolleston Manager, Richard Tait and STIHL Shop Christchurch’s Marketing Manager, Rebecca Hand. So if you’re selling then why not contact one of our experienced Country Partners to take you through the process, we’re happy to provide a free no obligation appraisal of your property and our team is committed to achieving the best possible result. Recently several of our vets across the country, were given the fantastic opportunity to go to a Practical Dentistry Workshop in Australia. They learnt from passionate professionals, who shared with them an extensive amount of knowledge of the complexity of dental disease, surgery and dental X-rays.